Every year as the raindrops start falling on other parts of the nation, freshly graduated software engineers start dropping on Bengaluru and hence starts their battle of finding an inhabitable place. They say you appreciate your life after you overcome some struggle. The good people of Namma Bengaluru took it by heart then, I guess. The “To Let”, “PG for gents” or “PG for ladies” boards in this city are as ubiquitous as the baristas. And the thing is, they are all equally bad in value for money. Consider yourself to be the luckiest person in town if you can find a good house through them. Nobody can beat their apathy. Be it 50 meters or 1 km, all houses are walking distance for them (Saar!! Walking distance saar!) and almost always, you walk through beautiful houses of Indiranagar just to be shown houses in Kodihalli or Huttingtown or Halasuru. It’s like telling your girlfriend that you’re buying her a new dress; taking her through the Vero Modas and the Zaras and eventually settling at commercial street. But hey! Not all houses are bad… Some are just worse. Have you ever seen a house having one main entrance into the bathroom? Well, you’d think that the owner probably had prostate problems but hold your desk tightly! His exact words were “This is the specialty of the house! When you return after getting a haircut, you can straight away go to wash your hair!” I don’t know what more to say about that man other than the fact that he was desperate to lease the place. On a related note, some houses are just built for efficient living. Who wants to spend so much of time in their morning cleansing! So we found a place where you entered a closet and boom! It’s a fully loaded bathroom designed for efficient use of water! I kid you not, they had put a shower facing the pot. Have a bath while you dump your daily waste I had asked the owner where was the bathroom in the house and I’m so glad that I did—otherwise I would not get to see such a genius design! I did not have to ask the guy, but I knew that he was an engineer. If they do ever manage to rent any of those places, I would recommend them as a case study in IIMs. I have a hateful relationship with the divine. Probably he doesn’t like my happy face (in his defence, it indeed looks quite horrible). When I came to the rock capital of India, I was filled with dreams of weekend concerts or some party at my friend’s place and what not! Finally when I found a house, my mind raced ahead to those days. But well, the divine… how could he let me have my way! When I met the landlady, I was asked for 10 months of rent as an advance. Now the thing is, I’m a gujju. My diet guarantees diabetes after a certain age prohibiting me from selling my kidney. But then! I’m a gujju! Business and negotiations should be in my blood, right? Umm, no. I just figured out a way to get that money and finished it off. So the rent + advance + in-time + no girls allowed = dreams shattered. But finally, after lots of compromises and life lessons, I found a house and hoped my struggle would have ended. But boy! 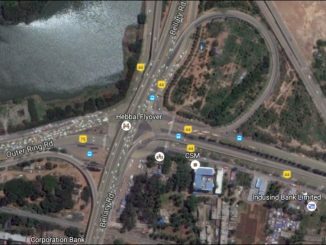 Does Bengaluru fail to challenge me? Oh no! After you find a house, you have to find a bai(maid) with whom you can have a longer conversation than “Kannada Gothilla” and find an edible food delivery option and then you have to find a good commute option and then face the Bengaluru traffic and then… And then… And then, the struggle continues. But all in all, Bengaluru is a lovely city with mostly beautiful people, beautiful gardens and oh-so-lovely weather! Just find a place with an access to the terrace and you will forget all the problems in life. #SteelFlyoverBeda. What do Bengaluru citizens want? For the first time in the history of Bengaluru, a movement for sustainable transport has caught the imagination of public. What’s it all about? Simple ! When you are in “Rome do as Romans do” follow the customs of the local population. This is a wonderful city given me job, place to live and why not I learn the local language? For many only solution to all problems in Bangalore is Learn Kannada, what if all of them learn kannada then Bangalore will be even a hopeless place. Learn a little more than “Kannada Gothilla” and that will help you explore more of Bangalore….including housing renting opportunities, without going to autowallahs. Remember, there are many websites that provide hundreds of listings of rented properties…where even “Kannada Gothilla” will help you find good to excellent rental properties in almost all localities of Bangalore. Moreover, just accessing and remaining on a terrace will not keep you grounded. Your isolated bad experience should not be misleading to the many people from all over India who come to Bangalore to make it their home.